MyTxCarry makes it easy for LTC holders to see where they can and cannot carry before they arrive, eliminating the need for an unnecessary trip back to the car to secure a firearm. Available for free on iPhone® and iPad®. See where you can carry on a fluid map with intuitive icons that tell you where and how you can carry. 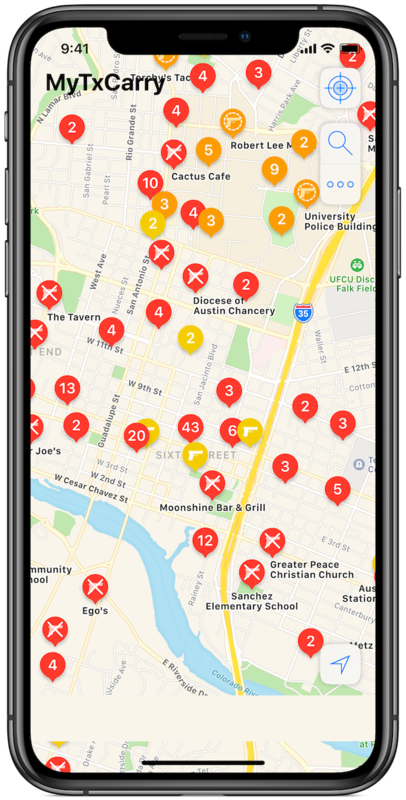 With crowdsourcing, data from across Texas automatically updates on your device. Completely free to use, no subscriptions, no upfront payments, period. This is the land of the free. The knowledge you want, wherever you need it. Quickly find places where you can carry, with search and filtering.